the retrospectoscope is a pain in the rear. I meant no criticisms of you or your doctor. I also have no criticism of my doctors. Good to hear my pioneering days are not over Thank you, that gives me some solace. drsclafani wrote: Well, now that the symposium is completed, i have had some time to think about interesting and informative cases. Speaking of that symposium, how was your IVUS talk received? Did any of your colleagues bring up anything that made you think differently about any aspect of CCSVI? Is Dr. Beggs really onto something? I've yet to work through his ideas, but I'm guessing it's worth the effort. Dr. Siskin has weighed in here at TIMS on what he said at the conference about him seeing less positive outcomes and more risk of thrombosis if a patient has multiple procedures. Did the discussion at the doctors' days influence your thinking from what you said at the patient day, that as far as you knew so far, it was unlimited? drsclafani wrote: So discussion number one. Should I have stented this vein? Since there is no obvious malformation or tissue change, it could be the result of the acquired posture after all these years of disease burden. Seen that way, it may not have great contribution to the overall situation and could be reduced by other means, ie exercising neck flexibility, adjusting sitting and sleeping posture, relaxing muscle tension. Thus, stenting might be too much. drsclafani wrote: i think that this problem needs to be corrected by better sleeping devices, perhaps improved pillows and re-education about positions of sleep....easier said than done. We must also understand that the position of the head for the procedure is not natural, only reproducible. Tilting the head only a little bit made a difference in flow and reflux. Those are very intriguing comments. **Does it appear that there may be general sleep positions that would be helpful to all (or almost all) cases of CCSVI, or does that seem to be completely unique to the individual? **Do you have any general positional recommendations to us that would help us even a little bit to keep our blood flowing? You know, like, "Stand up straight!" "Don't slouch!" "Don't eat with your elbows on the table!" Stuff like our moms used to tell us? Seriously, I've actually been making a conscious effort toward better posture in the last few months - not sure if it made any difference, but didn't think it could hurt. Maybe it could hurt if I'm doing it wrong. One more comment: In the last year I've developed such a severe case of reflux at night (wake up choking to death, aspirating into my lungs) that finally got me to prop myself up on a long incline of pillows that gradually raises my head about 1-1/2 feet (lower than that doesn't work). I have to watch that I don't let my head curl down, and position it as straight as I can. After I got used to it, I've found I sleep better than ever and my dreams are becoming more and more frequent, vivid, and memorable. That's cool. Dr Sclafani thank you for enerything you do for us.I was very pleased when i read that narrowing renal vein affects CCSVI. I did the procedure in June.I started to deteriorate dramatically although my ultrasound is good.For this deterioration can be responsible other veins except jugular and azygous veins? vlpg, welcome to tims and to drsclafani's thread. I wonder if it might help him to have a little more information. Did you have any improvements after the procedure before deteriorating? Was your ultrasound done by someone experienced in CCSVI ultrasound? Were you on any anticoagulants? Nice to meet you!Cece,thank you for your reply. I suffer from ms 6 years in relapsing form. I have several relapses 17 until now with many symptoms. Last year i had the procedure 3 failured times. The vascular surgeon who made the procedures had not enough experience to this procedure. Although, after my 1st procedure I saw many improvements for a month but then i became worse. I made an other ultrasound to a radiologist who is the best here in Greece and takes part to a clinic trial. He found that in left jugular vein i have valve promblem(my valve didn't move and i had a diaphragm) in right jugular i had a diaphragm ,and my azygous seemed that had also blood flow problem.He reffered me to another interventional radiologist to redo the procedure.They have spent almost 2 months since then.I did ultrasound 2 times after the procedure and it was obviously that it was good. What concerns me is that i become worse. So i wonder whether other veins are likely to cause this deterioration. there were someone who stated that there really wasnt any use for ivus, that it was an academic tool. However that person does not regularly use it, so i do not know what that opinion was based upon. Dr Zivadinov, whose group does use it, suggested that IVUS was probably the Gold Standard. Another opinion. You all know my opinion. The Gold Standard includes venography and IVUS. You are too much cece, you put the question and the answer back to back. I like the way Dr Beggs explains things. he works on mathematic models using data published by others. He is so brilliant in his clarity as he explains the logic of the physical world. If i recall, i meant the number of procedures that could be done on a patient could be unlimited, meaning that I didnt have any way to know what the limits are going to be. We are not treating something we have long experience with. . Angioplasty of stenotic valves in veins that are often dilated above and below the stenosis iw quite different from anything else we have done. We still have little detail about each practitioner's techniques so we cannot tell which maneuvers injure veins. I have had the opportunity to re-treat a few patients who had been treated at sites in Asia, North America and Europe more than one year ago. The majority of the problems were either missed or underestimate obstructions or they were related to stents. 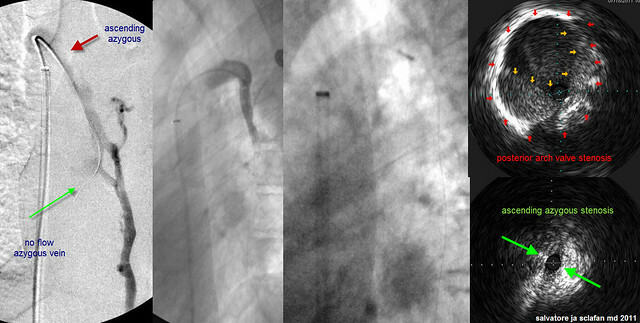 Many other vessels were treated, yet on a venogram at the one year mark, it was often difficult to detect the sites of angioplasty. So where is the evidence that repeat procedures result in worse damage to these veins? I have also seen patients have less improvements from a second procedure. We have to figure that one out. The more I know, the more I realize how much there is learn. Thanks, DrS, for putting this case together. I can't believe how much I keep learning from you. In what way(s) can pillows be improved? Regarding "re-education about positions of sleep," what sleep positions do you recommend? i am a plumber, if fix drainage pipes. I have favorite ergonomic pillows that i use personally but i would not presume to advise on sleep therapies. We have so many specialties to entice to join us. cece, what does it mean to be overly damaged? A vein that is completely obstructing is already overly damaged. Stents are an attempt to overcome the damage. mo_en wrote: Dear Doctor, is there a way to cut out inert valve leaflets without getting involved in open surgery? What are the risks of such an intervention? Wouldn't this be an acceptable measure to deal with continuously restenosing veins, provided that all annulus issues have been resolved successfully? while not used in jugular veins, there are devices that can snip pieces of valves from within the vessel. There are also valve replacements. the goal is to open the obstructions with minimal injury to the vein wall. there is no consensus on best practices to make that possible. Overly damaged has a permanence that overly diseased does not.... A vein that by nature is completely obstructing is overly diseased, in my opinion. Loss of the vein after a procedure is overly damaged. You are very good at what you do and, with this azygous stent, the benefit would seem to be worth the risk. Cece wrote: Did any of your colleagues bring up anything that made you think differently about any aspect of CCSVI? I have been digesting his ideas since bologna. I was making it easy on you, you are presumably still recovering from those 48 hour days. Or he could still be recovering from my marathon procedure! Yes, just got back home to Greece and swung by this thread as Dr. S. mentioned he might be writing up my case. Wow. What a lot of venous woes I have! Anyways, thanks for all discussing my case. I have always been a fan of the hive brain.